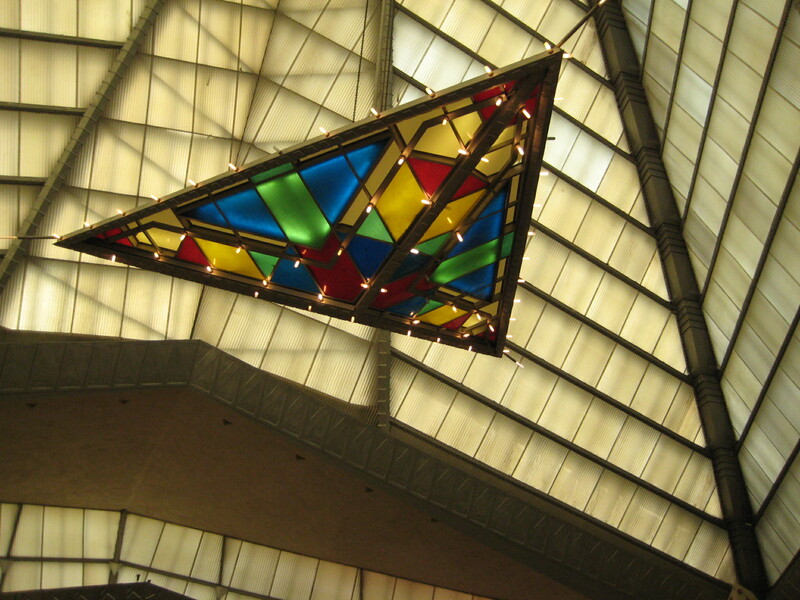 The roof of Beth Sholom Synagogue in Elkins Park, Pa.
Wright's "light basket" chandelier over the Beth Sholom interior. The sanctuary of Beth Sholom. Frank Lloyd Wright, 20th-century America’s most famous and probably greatest architect, was a busy man: in addition to about 200 private houses, he designed churches, schools, colleges, and office buildings; a tennis club and an amusement park; banks, hotels, shops, medical clinics, a civic center, a theater, and a museum. Not to mention furniture, windows, and light fixtures. And one synagogue, Beth Sholom, in Elkins Park, Pa., just outside Philadelphia. It was to be one of his last major projects, begun in 1953 and completed in 1959, just a few months after his death. Beth Sholom, a Conservative Jewish congregation, was originally formed in Philadelphia in 1918, its name meaning “house of peace” in honor of the recent end of World War I. Shortly after another war, World War II, the synagogue moved to suburban Elkins Park, where much of its congregation had relocated in the post-war boom years. And in 1953, its rabbi, Mortimer J. Cohen, approached Frank Lloyd Wright with an idea for a new synagogue. What chutzpah! Not only did the rabbi write to the famous architect with a request to build a “new thing,” as he called it; he even enclosed some sketches for what he had in mind. Amazingly, Wright responded immediately, agreeing to explore the idea of building “an American synagogue.” Thus began the six-year collaboration between rabbi and architect that culminated in a building recognized by the National Trust for Historic Preservation as one of Wright’s 17 most important buildings, and declared a National Historic Landmark in 2007. Wright based much of his design on an unbuilt 1926 project for a “Steel Cathedral for a Million,” which was to have been an interfaith cathedral and the world’s tallest building to date. 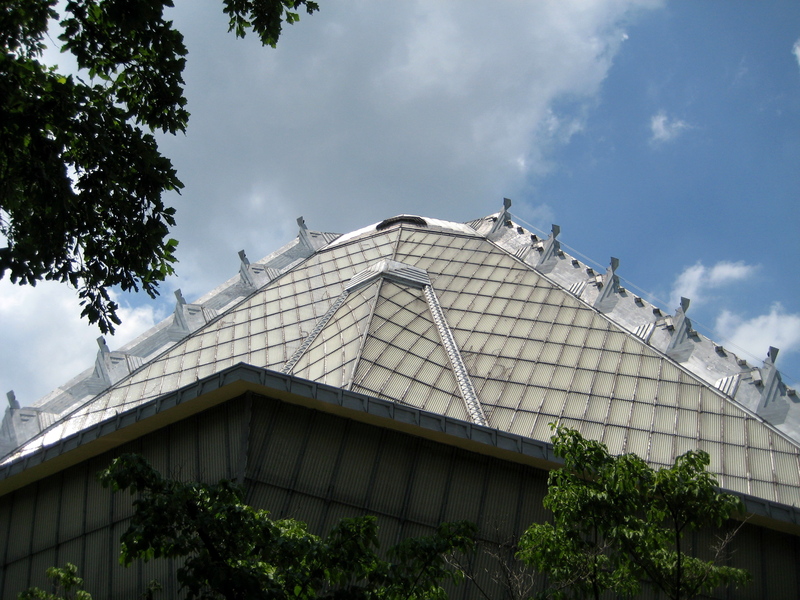 For the synagogue, Wright envisioned “a luminous Mount Sinai” and combined the mountain symbolism with images of a tent. He also employed elements of the Mayan Revival style popular in the 1920s and 30s—pre-Columbian pyramidal shapes, tilted exterior walls—which he had used in the his 1920 Hollyhock House and Tokyo’s Imperial Hotel. The building process was not without its glitches and quarrels. Though mostly cordial, the correspondence—letters and telegrams—between Cohen and Wright had its acerbic bits. The contractor was not the right man for the job; construction wasn’t moving fast enough. Many of the letters and telegrams are on display at the synagogue’s visitor center. The structure that finally emerged is hexagonal, like two cupped hands. “When a man enters a place of worship, he should feel as if he were resting in the hands of God,” stated Wright in typically pompous fashion. The concrete walls hold up a pyramidal roof supported by three beams. Each of these has seven ascending menorah-like lights. The roof, its peak 100 feet above the sanctuary, is made of a sloped, translucent double layer of glass (on the exterior) and fiberglass (on the interior). The main sanctuary, which can hold more than 1,000 people, is illuminated by daylight (a smaller sanctuary accommodates about 100). “…It moves with quiet grace and charm; its lights and shadows continually change with the coming of the sun and the passing of a cloud,” said Rabbi Cohen of the finished sanctuary. The floor is sloped towards the bimah (the platform from which the Torah, or scripture, is read). Wright originally wanted some of the roof panels to be colored, but as this proved to be too expensive, he settled for designing a magnificent chandelier—a “light basket,” he termed it—made of colored panels of Plexiglass. Like the chandelier, almost all the other furnishings and accessories—pews, light sconces, door handles, ventilation grilles—were designed by Wright himself. All of the materials used were American, in fitting with the “American synagogue” theme. Flame motifs and geometric patterns, especially triangles, abound. So, unfortunately, do the plastic buckets and basins to catch the drips from the leaky roof, a common feature of Wright buildings. But no technical description quite suggests the real-life physical impression of the building: it’s literally breathtaking. “The space…is just magnificent. It’s exhilarating. Everything just soars,” wrote Paul Goldberger, the New Yorker’s architecture critic. The light, the height, the harmonious colors (chosen, of course, by Wright) convey a spirit of awe that’s hard to verbalize. When even a non-believer like myself can be put into a spiritual (not to mention aesthetic) trance, that’s remarkable. In 2009, in celebration of the synagogue’s 50th anniversary (and in hopes of raising funds for much-needed repairs), the congregation opened a visitor center in the Wright-designed Robin Lounge, one of several rooms located in the building’s lower floor. It’s a beautifully designed center, featuring exhibits about the synagogue’s construction, including copious examples of the correspondence between the rabbi and the architect, touch-screen displays, timelines, and oral histories. An excellent 22-minute video narrated by Leonard Nimoy chronicles the synagogue’s history. Docents lead tours of the building. Of course there’s a gift shop, featuring books about Wright, and Wright-themed objects such as vases and scarves. 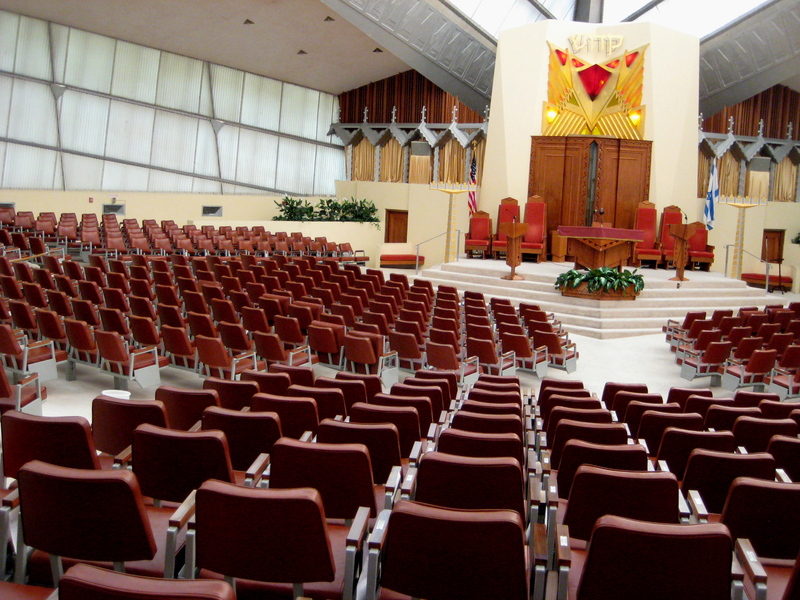 Beth Sholom Synagogue is located at 8231 Old York Road, Elknis Park, PA 19027; phone (215) 887-1342. Tours are conducted Wednesdays and Thursdays between 10 a.m. and 1 p.m., Sundays from 10 a.m. to 3 p.m., and by appointment. Groups of 10 or more can be accommodated by appointment only. General admission is $10, or $8 for students, seniors, and groups of 10 or more. Children under 10 are free. Reservations are recommended: phone (215) 887-1342.